In today’s verse, God tells us to be anxious about NOTHING. Speeding tickets … tests … denting the car (I did that this week, ugh!) … broken relationships … money … college … kids … etc. How are we to be anxious about nothing? Instead of worrying, God gives us something else to do. Pray. Pray ’bout everything. Big things, little things, hurtful things, fun things, special things, ordinary things … everything. The Greek word for everything used in today’s verse is the little tiny word pas, which simply means every thing. As my favorite Bible teacher says, If God tells us to pray ’bout everything, it’s because everything can be affected by prayer. When you pray, tell God everything on your heart. Pour out your feelings. Finally, (gulp, big leap of faith) ask Him to answer your prayer according to His will. I have dealt with stress in my life; I know this one. Anxiety has left its mark upon my soul. But, God promises to guard our hearts and minds if we offer Him our prayers and supplications (confiding in God about personal needs) with thanksgiving. In general, when do we offer thanks for something? When someone has completed a service for us. God knows our prayers before we offer them. He is already acting before we say Amen. That is why we can thank Him. this life we live as Christians is a walk of faith, not feelings. If something is true, it is true regardless of how we feel. Truth is not based on feelings. If God says He is guarding our hearts and minds, we can believe it, despite our feelings. After we pray ’bout everything and thank God for acting according to His will, we have one more job to do: we meditate. Meditate on what? Because prayer is a battle of the mind. Satan will try to knock us off track. The world will entice us to worry. Our mind will try to lead us back to our familiar comfortable habit of worry. We must control our thoughts and focus our mind. What we think about is our choice. Stop the worry cycle. Turn your worries into prayers. Prayer-thanksgiving-true thoughts. Leave the worry out. 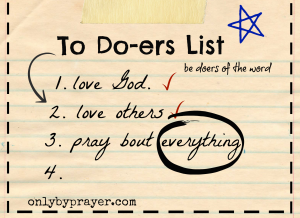 As you go about your day, pray ’bout everything. Laundry, dishes, driving, washing your hair, mowing the lawn, exercising, texts, phone calls, chores, friends, enemies. Cover it all in prayer. Pray ’bout everything. 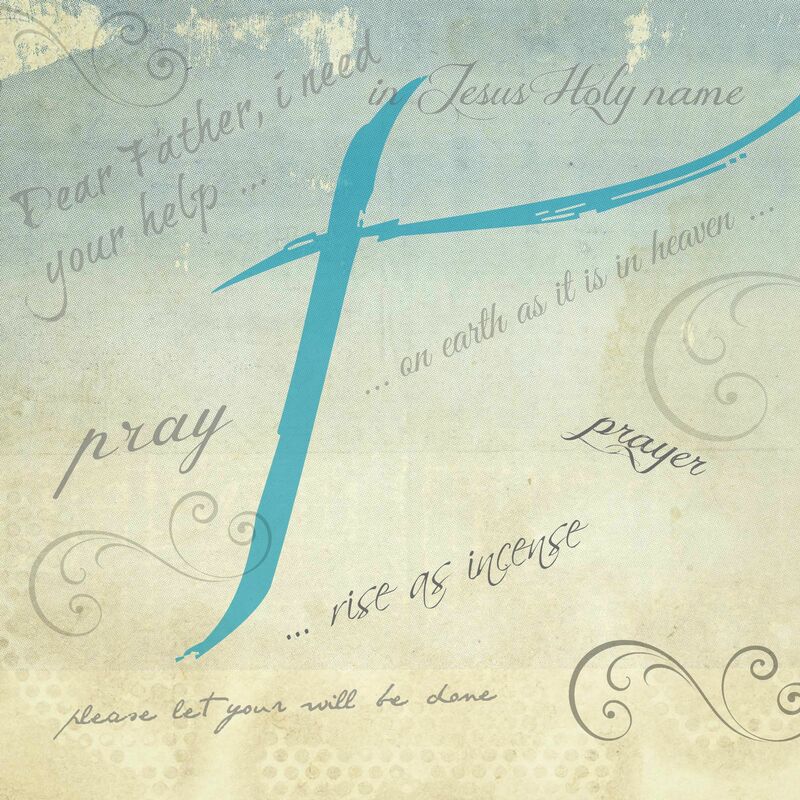 The Prayer Notebook App I love using this app! You’ll never forget a prayer request again. The Prayer Notebook even comes with an alarm for specific requests. 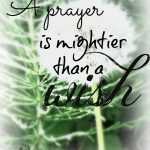 How To Pray Read this post for suggestions on how to enhance your prayer life. 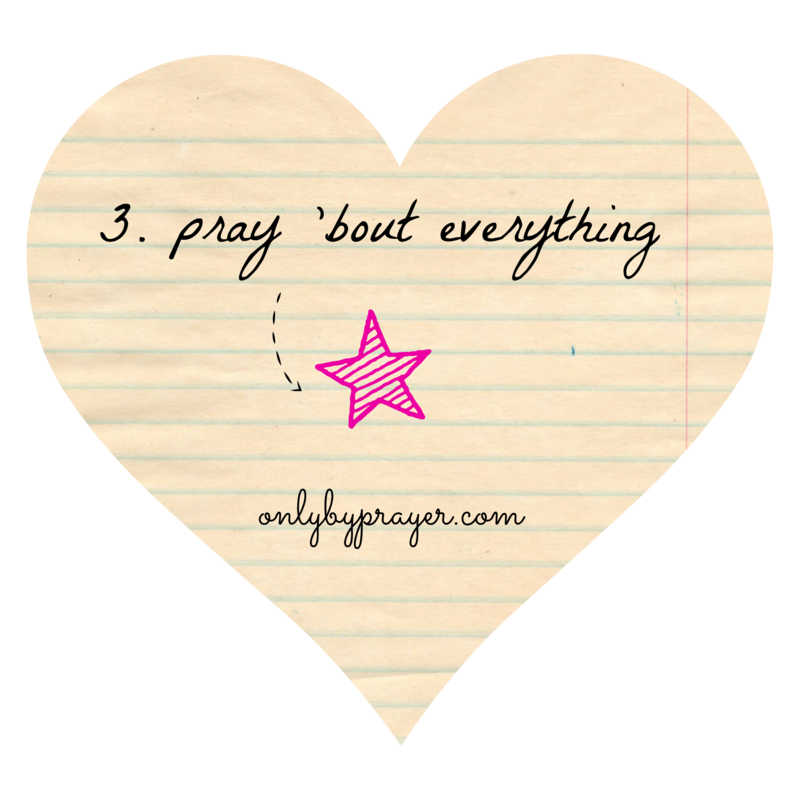 Prayer Strategy: When You Don’t Know What To Pray This post outlines a strategy for praying through life’s difficult and tragic situations. Start the day off on the right foot. Pray now for God to show you things to pray for and to remind you to pray throughout the day (or set the timer on your prayer app). Don’t forget to leave your comments below. I can’t wait to hear from you! In case you missed the first two days, click on the links below. Dear Father, May my life to day be a litany of prayer instead of worry. You have not given me a spirit of fear and worry, but one of power, sound mind and love. I do not have to continue in worry. I can choose to be free, because in Christ I am free indeed. I can rest in you because you hold me in Your hands. I thank You. Those are all lies because he does not want us to pray. So jump in with confidence knowing that God is already listening and waiting to move on your prayer! I’ve heard it said all my life… Just pray about it. It just seemed too easy! That can’t be it! But this summer, my prayer life has deepened more than I could have even imagined! I’ve learned to pray about everything. I’m still learning! But I feel it, I feel the peace which surpasses all understanding covering over me. I know lots of people pray for me too. It’s amazing how something small as praying for someone can make a BIG difference in their life maybe even without them knowing! When a friend comes to me and says, “Jess I’ve been praying for you”, is it crazy that I can say back, “That was you?! Thank you! I could feel your prayers with me during my hardest hour this week!” I know there are friends praying for me! I am so thankful for constant friends who never leave me. How can I ever repay you my friend?… I hope you know that I’m praying for you! Seems so small but God will do many things if we only pray! Beautiful response, Jessica! You are so sweet! I am SO VERY comforted by Gods word. I can’t say with words how grateful I am to serve a God who allows & encourages me to pray about everything!! I’m once again in awe of Him this morning. SO IN LOVE ?? Amen, Tricia. As both you and Mary said EVERYTHING. We don’t have to be ashamed of bringing big or little things to Him. Ha ha! Tricia! That would only happen to you! I have been praying for you, Tay and Taj! You can do this! I was guilty of thinking I had to have a reason to pray. 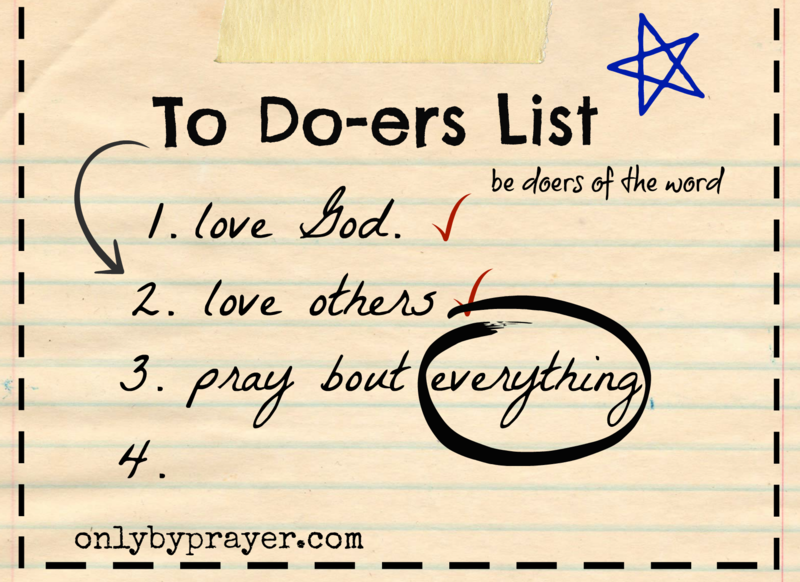 Instead of praying about everything. Now I pray while driving to work or going someplace. I just don’t bow my head or close my eyes. I love to thank God for the beautiful sunrise while heading to work. And for all the provisions He blesses me with each day. I have this precious gift called prayer. I just need to learn how to use it and have the faith to use it daily in my life. Thank you Lord for this bible study, may You be glorified! I am a fellow car prayer, like you. I am so glad God is teaching you about prayer. Your prayers are important! I spend my drive into work each day in prayer with the Lord. Sometimes, I feel like I probably sound like a broken record to him but in my heart the things and people I pray for are so important to me. Praying about things I am worried about is easy but sometimes praying and giving it over to God isn’t so easy…I always find myself taking it back. I want to learn even when I am busy to stop during the day and pray. Ah Ha! Another car pray-er! It’s better to pray in traffic than grumble. Does a mother ever tire of hearing the sweet voice of her baby? Your Father never tires of hearing you! “Prayer – thanksgiving – good thoughts. Leave the worry out” !! Isn’t it wonderful how the things we are told to meditate on will lead us far away from worry? The Father who watches over us and those we love will never slumber nor sleep (Psalm 121). What a comfort it is to meditate on His attributes, pray about everything, and leave worry behind. Thanks, Mary! You are welcome, Nancy! I pray you are settling in! No more break downs or flat tires!